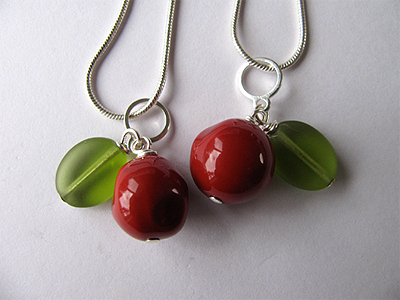 A cute little painted mother of pearl red apple with a single green leaf hangs from a simple snake-chain cord with a starfish charm accent on the clasp. The red beads have little natural markings of dents and bumps so each one is unique! If you're looking to get more than necklace like this, there's a 2-necklace listing which can be found here. There is also a solid coral version and a coral version with a darker leaf available.